This twist on the age-old question of a tree falling in the forest, won’t be on the final exam at Learning Zone. But the sound that fizz makes is definitely up for discussion. That’s because, in February, Learning Zone students at our preschools in Nashville and preschools in Murfreesboro are exploring the science of chemistry. For the younger children, this means learning about bubbles! For the older students, this means learning about what a chemist does and even doing some of the things a chemist does. (Including wearing safety glasses!) 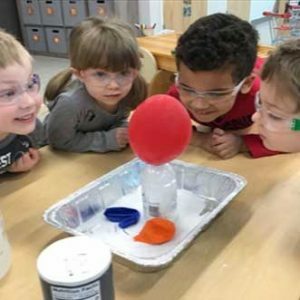 These activities are all part of the Learning Zone approach to the STEAM (Science, Technology, Engineering, Arts, and Mathematics) curriculum. What Can You Learn from a Simple Bubble? When you think about a simple bubble, you might think of blowing bubbles with a wand, or splashing soapy water to make bubbles, or even watching bubbles come to the top of a glass when you pour a carbonated drink. The younger students at Learning Zone are having fun with all of these activities. But they also are learning about bubbles and fizz through the senses. What do bubbles in a soda feel like in your mouth? Can you see what’s inside a bubble? Do bubbles make a sound when they pop? Are Bubbles Important to a Chemist? The short answer is, “Yes they are.” Our older children are learning why. They are learning about bubbles and fizz as they relate to a chemical reaction. For example, they are learning the science behind making slippery slime and making lava lamps. If you have a budding scientist, contact Learning Zone for more information about our STEAM curriculum. The STEAM curriculum is used at all three Learning Zone locations – one in Nashville and two in Murfreesboro.